We all have, at the very least, one issue with our hair that plagues us constantly. For some of us it’s unruly frizz or split ends, and for others it’s flatness and thinning strands. Some of us even deal with all of those concerns at once and it can be seriously exhausting, time-consuming and expensive to keep everything under control. If only there were an extremely easy-to-use, celebrity-loved product that could take care of it all. Oh wait, there is! The Keranique Lift & Repair Treatment Spray targets all of the above concerns and even more, and celebrities are seriously taking notice. The stars of The Real Housewives of Beverly Hills seem to have it all: big houses, glamorous lifestyles, absolutely insane drama . . . and most importantly, beautiful hair. Kyle Richards, especially, has a ‘do worth swooning over. Thankfully, she was kind enough to let us all know about how big of a difference Keranique has made in her life, naming this spray as one of her favorites. She knows her stuff too — she has her own hair salon in her house! 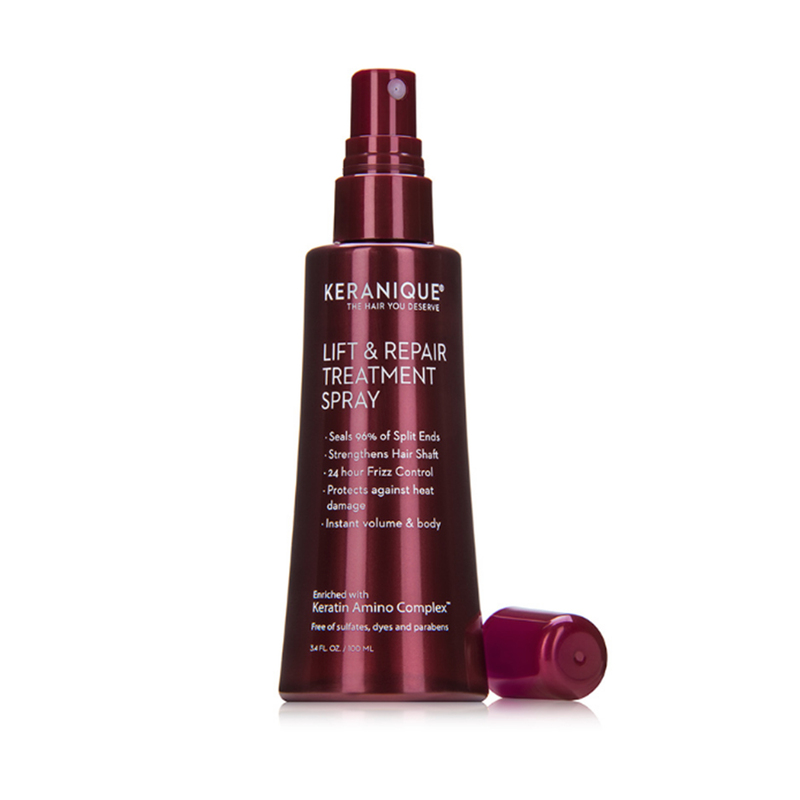 See it: Get the Keranique Lift & Repair Treatment Spray for just $15 at Dermstore! Also available at Amazon! Let’s get a little more into what’s inside this magic spray bottle. Lightweight peppermint oil may act as a natural astringent for our scalp, balancing out our oil so our locks won’t be weighed down. It works together with panthenol, which claims to “lock in hydration” for soft, smooth, frizz-free hair, “even in humid weather.” This spray actually claims to keep our frizz under control for a full 24 hours! There are also advanced keratin fibers inside this spray, which may coat our hair to leave it thicker with a noticeable lift. This spray used to be known as the Amplifying Lift Spray, so this is all making sense. How about those nasty little split ends? This product claims to actually seal 96% of them, targeting all of our concerns from root to tip! It may help us to prevent future split ends too because of its heat-protectant capabilities. Ultimately, we may be left with “bouncy, shiny hair full of body” that’s vibrant enough to rival Richards’ hair! It’s important to note that while all of these benefits may be fabulous, they wouldn’t be so effective if it weren’t for what’s not inside this product. It’s sulfate-free and paraben-free, two requirements we check for when buying any shampoo, conditioner or hair treatment. It’s also dye-free and shoppers say it’s totally safe on their color-treated hair! Richards explained how she uses this spray, but we want to get more into the details so everyone knows just how to get the maximum effect out of the treatment. To use, we start off by washing and towel drying hair so it’s not dripping wet. We then spray this product onto our roots, using our fingers to comb it down to our ends. If we’re in a rush or feeling something simple, we can stop there, but for added lift and volume, it’s blow dry time. We then set our dryer to the medium setting and flip our hair over, continuing to comb through it with our fingers. If we want a little more lift, we can spray on a little extra product. Keep blow drying until hair is completely dry! With this treatment, we’re feeling like beauty queens, but with way less hair spray. Or maybe we should say we feel like one of the Housewives! Now all we need is a TV show. Looking for something else? Check out more from Keranique here and other styling products available at Dermstore here!